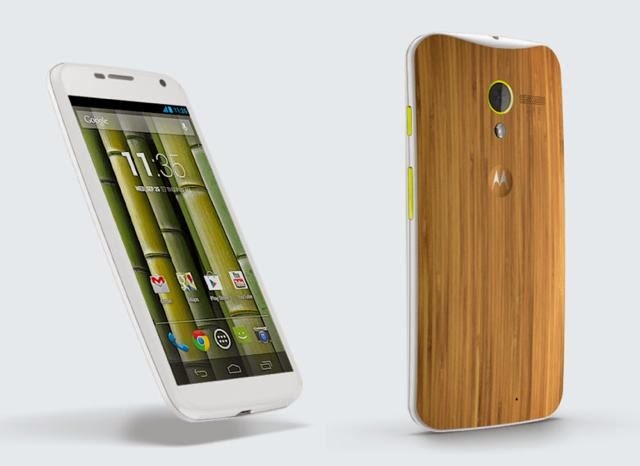 Motorola could sell Moto X+1 in August, but the leak is already succeeding and show including a rear wooden hull. According to a Brazilian distributor, which released the poster for the Moto X+1 by mistake, the smartphone is equipped with a 5.2 inch screen resolution of 1920 x 1080 pixels, a Qualcomm Snapdragon 800 processor clocked at 2.2 GHz, a RAM and 2GB storage space of 32 GB expandable up to 128 GB This smartphone could also be equipped with a rear camera sensor 12 megapixel with flash and autofocus, and a battery of 2900 mAh . Also, pictures of a prototype has just been published. It is not the final model, but it provides guidance. In terms of design, Moto X +1 does not stray habits manufacturer. It seems that users can choose between 25 personalization options, including a rear shell Kevlar or wood (or faux wood). What make a touch of originality. These information are just rumors and must await the official presentation of Motorola.